Elburg to Nijkerk on another windy day after we gave up on the messy port at Hardervijk because we found it to be one huge building site. We had been sheltered from the strong winds of the Randmeren whilst we were moored up in the centre of Elburg Binnenhaven but once we left this shelter, we found that today was a very windy and unpleasant one to be on the water. We visited the Elburg Tuesday market before leaving; sharing some kibbling between us in place of any breakfast or lunch. Whether it was because it is early in the season or not, the size of the market seemed to be very disappointing and the weather was quite blowy as we dodged the showers, but Max enjoyed the trip out before we set off on our voyage. We needed water to replace that amount used for two cycles of our washing machine and so dropped off at the water berth on the way. Unfortunately, a German boat was taking up the space and the hose and then started washing his boat after filling and so I was rather upset with his selfishness. Eventually away and into the Veluwemeer where wind and water condition started to become an issue and that developed as a worry as we had left the ‘porch’ canopy up and the wind was stressing it. We passed a number of deserted resorts on the Flevoland side such as ‘De Klink’ and moorings islands such as ‘De Snip’ and ‘De Kwak’ and it was on one of these that we saw Broom boat ‘Rockall’ and exchanged greetings. By this time, we were getting wind gusts of anything up to 29 knots but it was mostly on the bow and manageable. 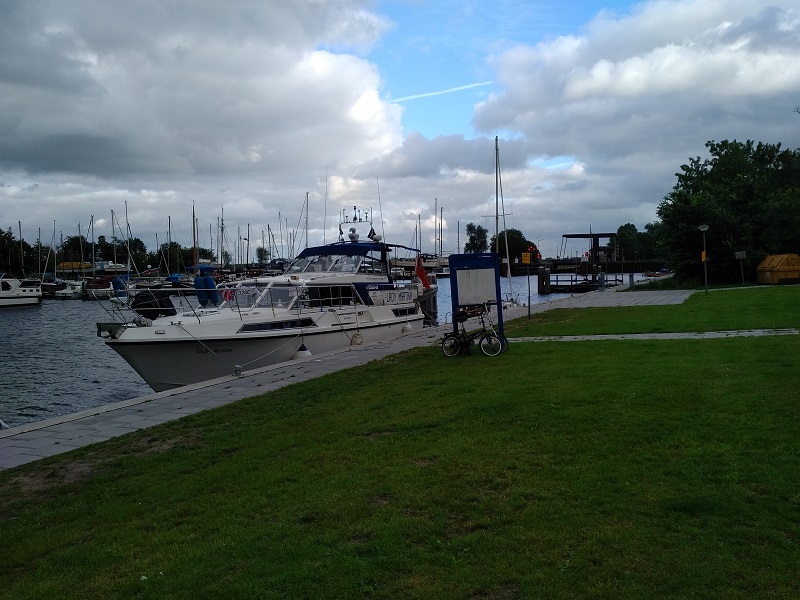 We managed the conditions until we got to Harderwijk where we arrived with 3-4 other motor cruisers all looking for moorings and competing with each other. There were very few to be found without rafting up, as the inner harbour, past the lifting bridge was blocked off and outside there was a horrendous amount of landscaping and building work taking place that had ruined the moorings. After some time reviewing the situation I turned Lady Martina in its own length and then headed back out across the north-east end of the Wolderwijd and around the Knarland Island. By this time the wind was on our beam and we did see some boats moored on the Knarland stieger but in very exposed and unpleasant conditions. The Wolderwijd was being raked by 20-plus knot winds and we also had a large barge, ‘Neptunus’ right behind us as we headed into the very open section of this meer in conditions which we might just describe as ‘moderate’ in off-shore terms but was easily as bad as anything we had experienced on the Ijsselmeer. We ploughed on, Lady Martina being more than capable of shrugging off such conditions and eventually the open lake narrowed and we started approaching the Nijkerksluis but were arriving a good ten minutes and one nautical mile behind the 'Neptunus', which had overtaken us rather grumpily. I was monitoring VHF channel 18 and heard his call and the response from the sluis and so I called and announced my approach ten minutes later and this led to the sluis-keeper waiting for me which was very helpful. 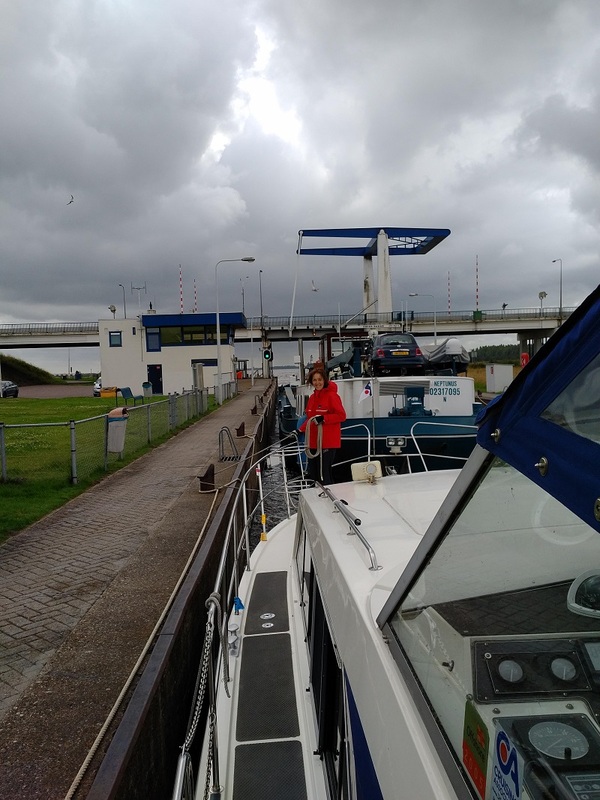 Once through Nijkerksluis, I was then able to turn left and enter the Arkervaart to find plenty of moorings on the right before the Arkersluis lock and then found a stretch that had some shelter from the wind. 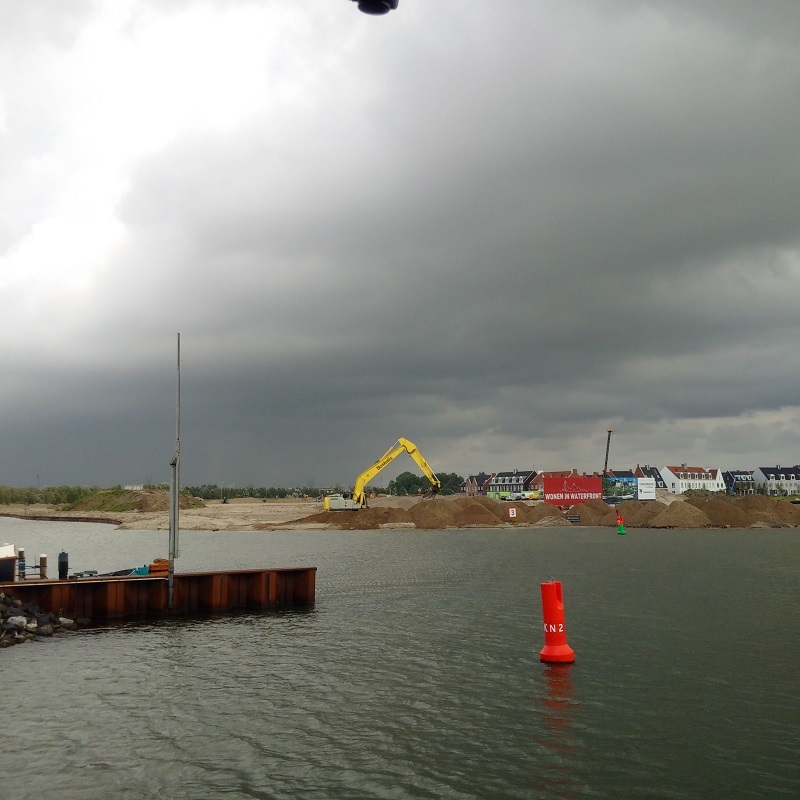 We moored up and I took the walk around the new caravan park to the Arkervaart sluis-keeper who takes the money for the moorings these days. This section of moorings had been modernised since I was last here and I found out from the lock-keeper lady that this process was only completed last year and so we were lucky to find it to be such a nice place this year, and for only €10/night! We were fooled by the special connection method that the power sockets have here; where you have to rotate the plug clockwise 90deg after inserting it. I have come across that necessary technique before but could not understand the Dutch instructions on the pod and had inserted coins for three connections on two pods before a neighbouring lady put us straight and we were able to get power!